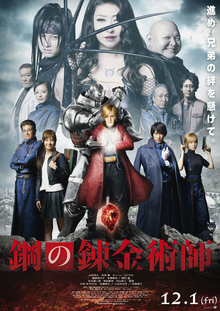 Ed and Alphonse hit the big screen in a live action adaption of the hit manga and anime series. For those who don’t know the film is about two brothers who are working for the government as alchemists. Al is no longer human but a walking suit of armor the result of a sell casting that went horribly wrong. His brother sacrificed his arm in order to attach his soul to the armor. The plot of the film has the boy still trying to run down the philosopher stone which will allow them to cast the spell to get Al his body back however they run afoul of a group of homunculus who want the power for themselves. Great to looking adventure is a nice adaption of the manga and anime. I’m a huge fan to my jaundiced eye they get it pretty much right. This is how I would imagined it would all look on the big screen. While the action set pieces on either end of the film are wonderful the film kind of sputters in the middle as there is a bit too much talk. While it builds character and moves the plot it also slows the momentum down. Slow middle or not I loved the film.